Chennai Super Kings defeated Royal Challengers Bangalore by eight wickets in their Indian Premier League match on Saturday. Chennai restricted Bangalore to 154 for six and chased down the target with 16 balls to spare. It was Chennai's ninth win in 13 games, and Bangalore's ninth from 14 games. The expensively assembled Bangalore side finished the tournament second from bottom. Earlier Chennai decided to field after winning the toss. 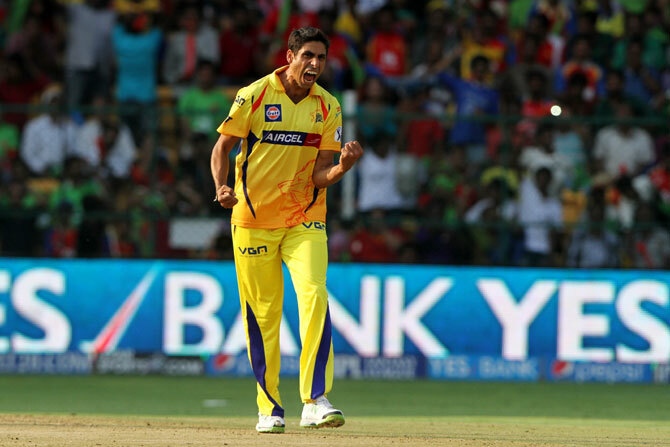 Veteran seamer Ashish Nehra, who was dropped after the first game came back into the side along with leggie Samuel Badree. The ones dropped are John Hastings and Pawan Negi. Bangalore made wholesale changes with Chris Gayle, Muttiah Muralitharan, Ashoke Dinda and Abu Nechim Ahmed also being kept out of the playing XI. The ones replacing them are Ravi Rampaul, Rilee Russouw, Vijay Zol and Shadab Zakati. Virat Kohli stood tall among his struggling teammates with a stroke-filled half-century. Kohli struck 73 off 49 balls with two fours and five sixes as some of the other batsmen failed to get going against a disciplined Chennai attack. Save Kohli, none of other batsmen could find their feet. Out of his five sixes, four were hit over the deep mid-wicket region while the other was hit in the long-off region. Kohli had a 55-run partnership for fourth wicket with Yuvraj and scripted a 42-run partnership for fifth wicket with De Villiers, before the mercurial South African was castled by Nehra. Kohli was finally out when Nehra bowled a well disguised slower delivery that rolled into the stumps. Ashish Nehra impressed one and all with figures of three for 33 including two beautiful deliveries to dismiss Rilee Russouw (1) and AB de Villiers (10). He got the South Africa's limited overs captain with a perfect yorker that pegged the middle-stump back. In his final over, Nehra removed rival skipper Kohli to show that Dhoni's decision to field him after a gap of 12 matches (he played the first match) was correct. 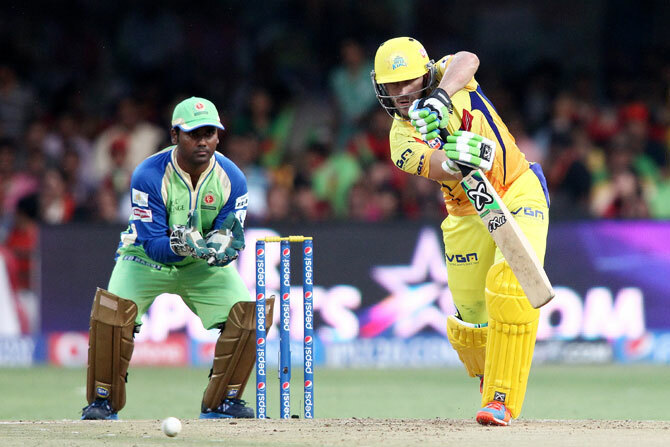 Chasing a modest target of 154, Faf du Plessis revelled in the role of an opener scoring an unbeaten 54 and also enjoying couple of fruitful partnerships of 57 for the opening stand with Dwayne Smith (34) and an unbroken 75 runs with skipper Mahendra Singh Dhoni for the third wicket. Du Plessis hit three fours and three sixes. The winning hit came off Du Plessis' bat as he lofted Jakati for a big six to end it in style. Dhoni, who is always in his element in the cash-rich league, smacked his way to 49 off only 28 balls to ensure that the run-rate is suitably beefed up. Dhoni's innings had four boundaries and three sixes. He was severe on the left-arm spinners as two of his three sixes came in Yuvraj Singh's one over and the other was hit off Shadab Jakati. He was awarded the man of the match for his effort. Chennai thus finished their league engagements with 18 points from 14 games by virtue of nine victories.